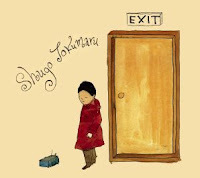 First Look: Shugo Tokumaru – "Exit"
With arrangements as excited and energetic as a sugar-crazed five-year-old but with the attention span of a serious composer, Shugo Tokumaru might be the Japanese Sufjan Stevens. Or, for a comparison closer to home, a poppier Cornelius. Exit was released in Japan last year to little fanfare on this side of the Pacific, despite the guy scoring a top 10 hit in his home country with a Cokemachineglow-commissioned “Young Folks” cover. Incidentally, the U.S. release is due on Peter Bjorn and John’s Almost Gold Records on Sept. 2. If you like PB&J, you’ll like this, but Shugo’s frenzied brand of acoustic indie-pop is much, for lack of a better word, cuter. Child-like and curious, songs such as “Button” and “Parachute” are as playful as the titles make them sound, but the sheer talent behind them ensures that even those with the shortest attention spans will want to keep this one handy for quite some time. Tokumaru is a tunesmith at heart: stripped of its literal bells and whistles, “Button” could pass for a McCartney song. And “Parachute”? It could pass for the song of the year, if I ever lose my attention for the Hold Steady.